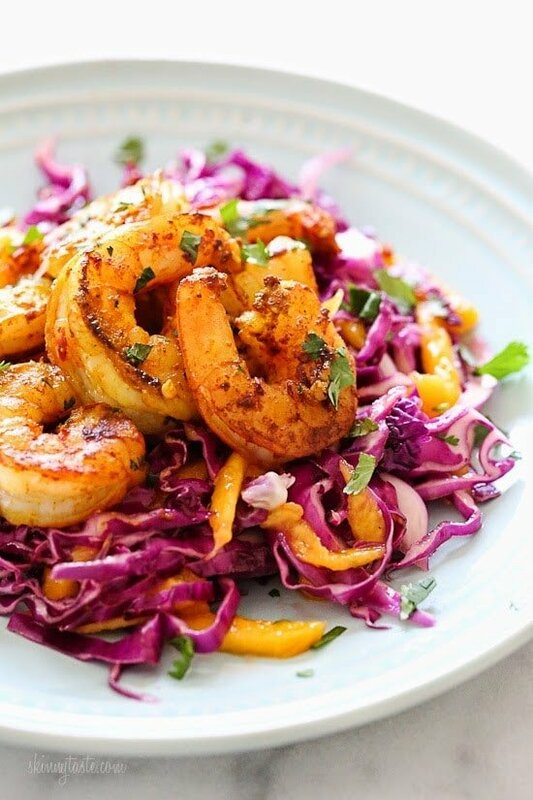 Tons of flavor in this quick, shrimp dish! The perfect balance of spicy, savory, sweet & sour – and ready in less than 30 minutes. 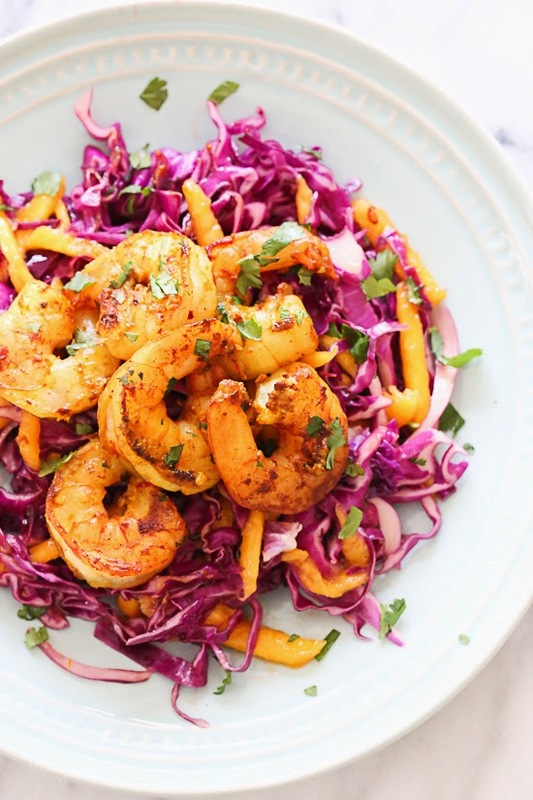 I seasoned the shrimp with turmeric, cumin and red pepper flakes, then gave it a quick saute with garlic and finished it with some fresh lime juice and cilantro. 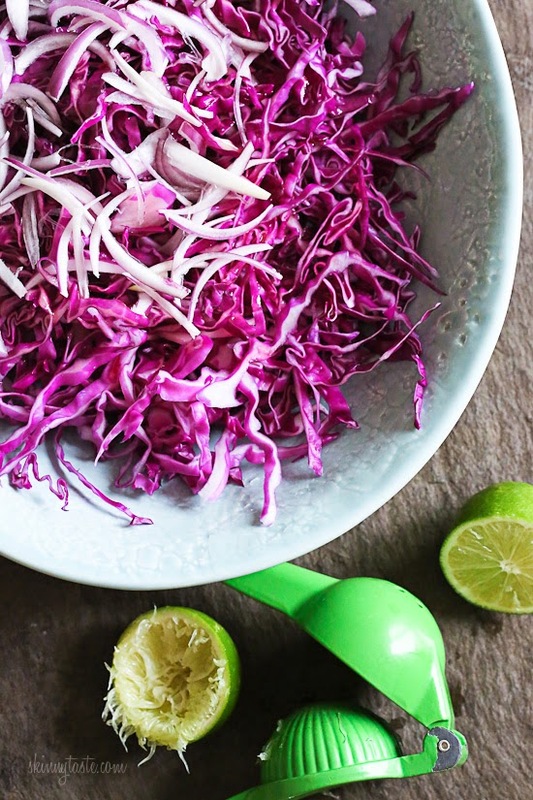 To balance out the heat (it’s mild, although you can make it spicier or leave milder to your taste) I served this over a quick slaw with sweet mango, red cabbage and lime juice. My husband gave it two thumbs up! This dish is perfect for most diet restrictions: gluten-free, low-carb, paleo, whole30 and of course weight watcher friendly! Combine 1 tbsp olive oil, juice of 1 lime, 3/4 tsp of the salt and pepper. 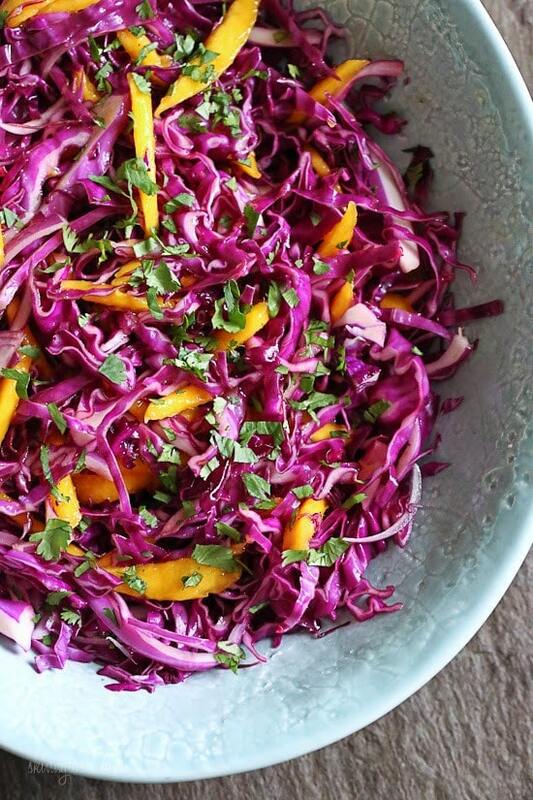 Toss with the cabbage, red onion, mango and 1 tbsp fresh cilantro. 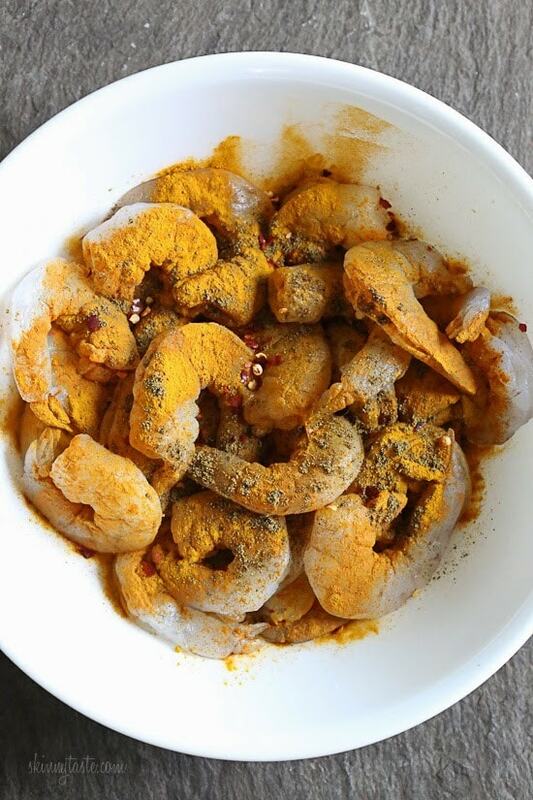 Combine shrimp with the remaining salt, turmeric, crushed red pepper flakes and cumin. 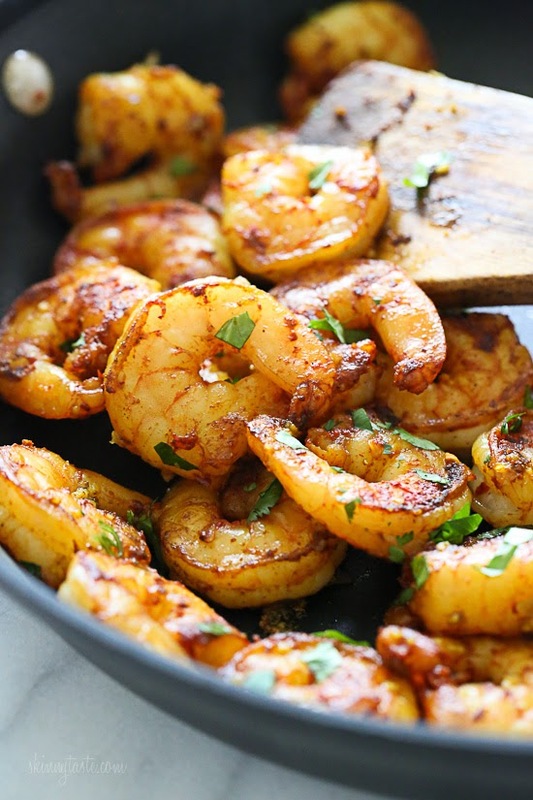 In a large deep nonstick saute pan over medium-high heat, add 1/2 teaspoon of olive oil, and cook half of the shrimp 1 1/2 to 2 minutes on each side, until shrimp is cooked through and opaque. Set aside, add the remaining 1/2 teaspoon of oil and remaining shrimp and cook until shrimp is cooked through and opaque adding the crushed garlic the last minute. Return all the shrimp to the skillet, stir to combine with garlic. 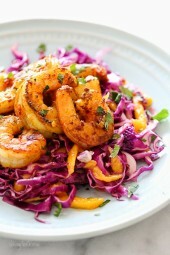 Remove from heat, squeeze lime over shrimp and toss with cilantro. Divide the salad (about 1 1/4 cups) and shrimp between 4 plates.